Thank you for contacting Leopold’s Ice Cream about your upcoming event/fundraiser. Leopold’s takes pride in our continued support of and involvement in our community. While we would love to be able to donate to every organization that requests our support, we are simply unable to do so due to the large volume of requests that we receive. We value the compliment you have paid us by requesting that Leopold’s Ice Cream participate in your event and will do our best to respond in a timely manner. If you do receive a donation, as a participant in your event, we would love to have photos of the festivities! We must receive a written donation request AT LEAST 4 weeks prior to the event/fundraiser. Requests received after our 4 week window cannot be considered. Requests made by organizations in Savannah and the surrounding areas will be given priority. Leopold’s Ice Cream is committed to supporting education and the arts. Requests from organizations that also support these causes will be given priority. We are unable to make cash donations. We will gladly donate gift certificates, ice cream, coupons or retail merchandise to causes that meet our criteria, if we have the available resources. – All requests must be submitted in writing, via email. Requests will not be taken over the phone. Requests must be emailed to info@leopoldsicecream.com. A brief summary of your organization and the purpose of your event/fundraiser. The date of your event/fundraiser and deadline for response. Will Leopold’s Ice Cream receive any recognition on promotional materials in exchange for our donation? If so, do you need our logo? In what format? Is your event for profit? Are you selling tickets to your event? What type of donation you would prefer: gift certificates, ice cream, coupons or retail merchandise? How will our donation will be used: Auction, prize, volunteer gifts? At times we may be unable to make a full donation but may be able to offer a discount. Are you interested in a discount if a full donation is not possible? 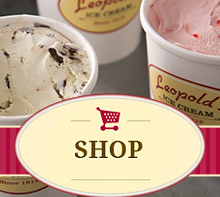 Again, thank you for thinking of Leopold’s Ice Cream for your upcoming event/fundraiser. We will contact you if & when we have a donation ready!